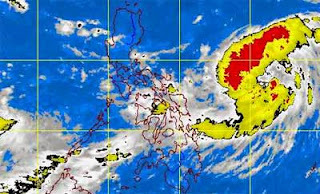 State weather burea reported that 'Quedan' intensified into a Tropical Storm and estimated at East of Virac, Catanduanes. Bagyong Quedan may not directly hit our country according to PAGASA as of 5 a.m., Tuesday, October 1, 2013. PAGASA weather bulletin said, "At 4:00 a.m. today, the center of Tropical Storm "QUEDAN" was estimated based on all available data at 790 km East of Virac, Catanduanes, with maximum sustained winds of 65 kph near the center and gustiness of up to 80 kph. It forecast to move North at 7 kph." There's no public storm warning signal yet as per PAGASA. However, the estimated rainfall amount is from 7.5 - 15.0 mm per hour (heavy - intense) within the 400 km diameter of the Tropical Storm. Comments or suggestions about "Bagyong Quedan developed into a Tropical Storm - PAGASA" is important to us, you may share it by using the comment box below.